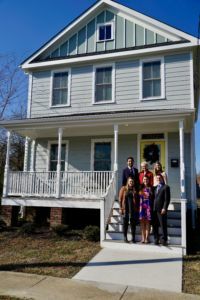 Bon Secours Ministry Volunteers live together in intentional community. The two BSVM houses, in Baltimore, MD and Richmond, VA are within walking distance of the volunteer ministry placement sites. The decision for volunteers to live in the neighborhood in which they serve is a deliberate choice to be in “radical solidarity with the poor, the suffering, and those most in need.” The location of the volunteers’ homes in Baltimore and Richmond enable them firstly to build relationships with their neighbors and also to better reflect on both the beauty and injustices that their neighbors face daily. BSVM sees the locations of our houses as sacred ground and spaces in which relationships are fostered and grow. The houses provide space for cooking, eating, prayer, recreation, sleeping, working, and other activities that allow volunteers to build intentional community. All volunteers share a bedroom. There are also many common areas available for volunteers to enjoy individual and communal time including a living, meditation, computer, and dining room. 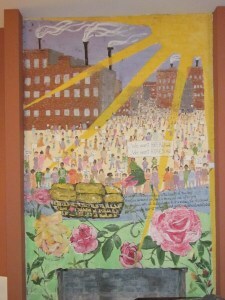 Photo: The ground floor of the Baltimore house has a beautiful mural above the fireplace depicting the Bread and Roses strike, which demanded justice for workers at a textile mill in Lawrence, Massachusetts in the early 20th century.